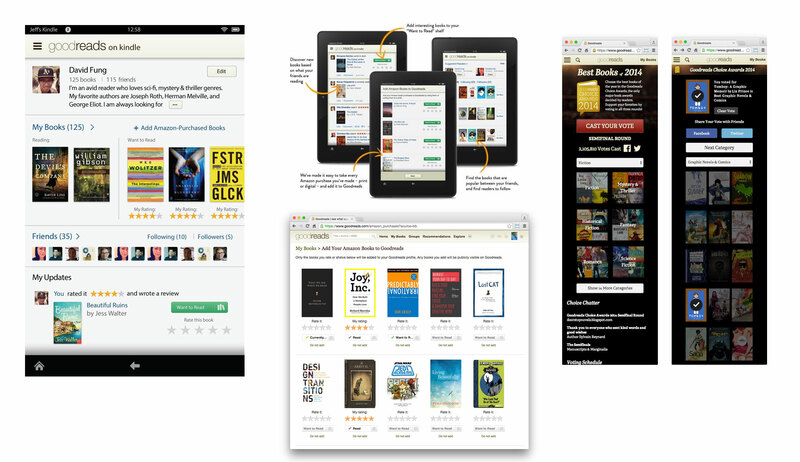 Role: Visual Design, Interaction Design for Profile screens on Goodreads for the Kindle Fire. Worked closely with my team at Goodreads and the Amazon design team to develop the interaction and visual design for the Goodreads on Kindle profile screen. Role: Branding, Visual Design, Interaction Design for Goodreads Choice Awards for mobile web and web platforms. Designed a new logo and updated visual style for the Goodreads Choice Awards and led the design of a new mobile web version. Worked closely with a product manager and developer to design the first iteration of the Amazon book import integration on Goodreads for desktop.